This short homecoming dress looks like a sparkling butterfly has spread its wings across the beautifully beaded bodice. The sheer v-neckline allows the sweetheart lining to show through so that the rhinestones and sequins create the illusion. Swirling gemstones climb the delicate mesh shoulder straps and form a glittering work of art across the v-back. The short skirt has layers of delicate chiffon that flare out to a rolled hemline on this sweet party dress. 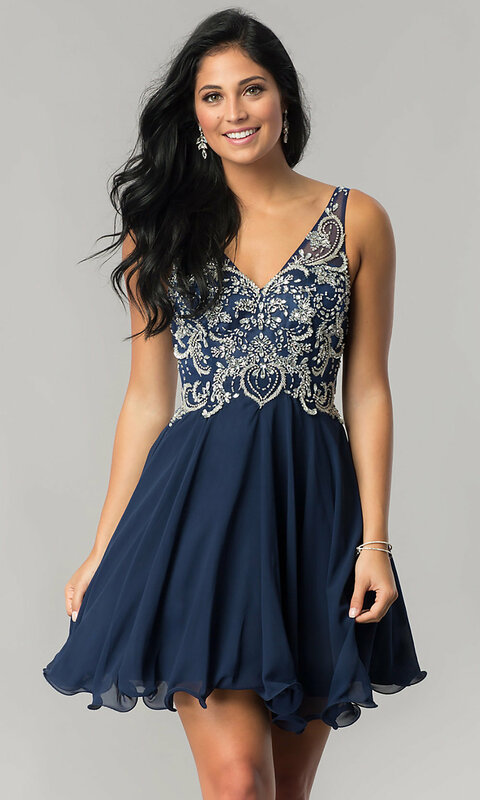 Under $200, this short homecoming dress with beaded design is an affordable fantasy come true for your event.